The Portland Advertising Federation, or the PAF as we like to call it, was the first advertising club in the United States. Probably because Portlanders love to meet across a smokey brew pub table, or maybe because we just like advertising. No matter what, we have been meeting regularly for over a hundred years, and even though we are the oldest club in the nation our ideas remain fresh and members continue to inspire. Take a walk through our history archive as we celebrate some of Portland, Oregon’s agencies and brands that have shaped the world of advertising as we know it today. 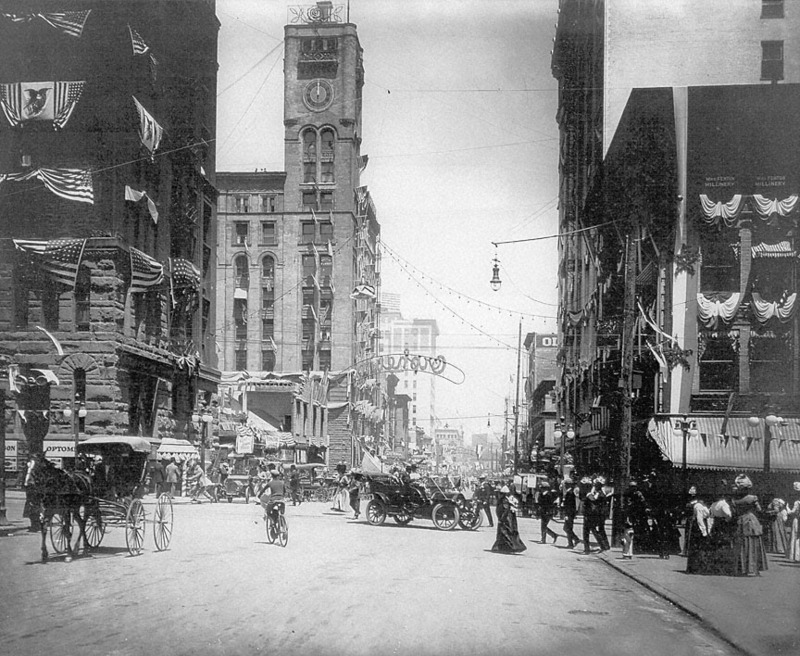 The Portland Advertising Federation was founded by a group of Ad Men in 1906 in downtown Portland, Oregon. Some history blurb about this. The Spotlight Newspaper, a weekly newspaper in the United States, published in Washington, D.C. from September 1975 to July 2001, shows the Portland Ad Group visiting the Oakland Convention on August 8th, 1917. The past year has been an epoch of making period in the affairs of the Portland Ad Club. But 1921 holds boldly as great a promise for accomplishment. I should like to see every disinterested member become interested. I should like to see every inactive member become active. An Expression From The Glee Club. Thanking the Portland Ad Group for their support and training. July 16, 1930. The Portland Advertising Spotlight Newspaper. Beloved comedian, Trixie Friganza pays Portland a visit and is greeted and hosted by the Portland Ad Club Members and serenaded upon arrival at Union Station by the Portland Glee Club. Spotlight, The Official Publication of the Advertising Club of Portland. June 27, 1934. Portland Advertising Club Presentation by Jantzen Clothing. AD-VANCE Newsletter, May 4, 1949. Lipman’s Portland Ad Club Presentation. AD-VANCE News from the Oregon Advertising Club, September 6th, 1950. 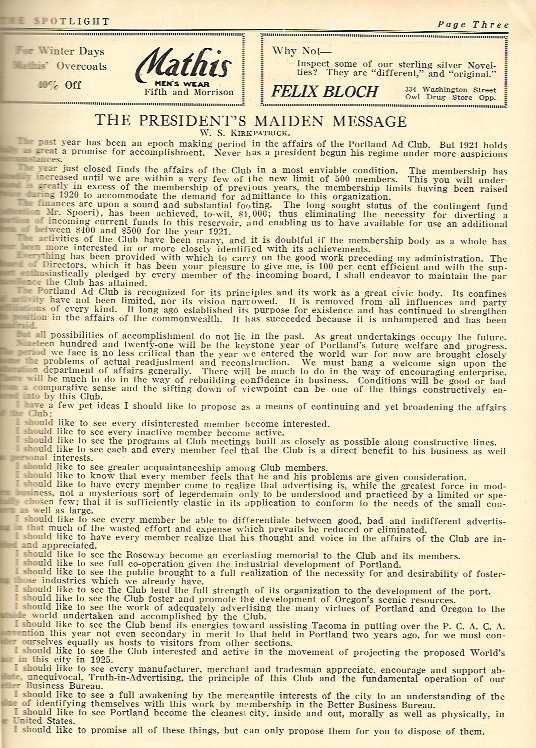 In 1973, in addition to the club’s Advertising Man of the Year award, an Advertising Woman of the Year was also selected. Isabell Hoyt from KATU had the honor of being the first women to be chosen. This image, of Ad Man and Ad Women of the year 1975 shows award recipients Richard C. Babb and Sally Goswell. "We’re off and Running. The Nike Story. Hear Phil Knight, globetrotting president of BRS Inc, tell how Nike emerged from a waffle iron to become a world-famous footwear brand. Nike presentation for the Portland Ad Club. AD-VANCE Newspaper, September 21st, 1979. A letter to the Portland Ad Club. Vic Atiyeh, Governor for the State or Oregon. Salem, 1984. 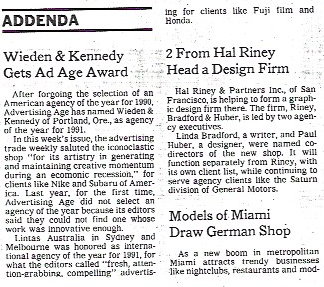 Weiden & Kennedy Gets Ad Age Award. New York Times, April 14 1991. My Mother Makes Combat Boots. Want to add to our archive? Have some historic ads or news to share. Please send them through and we will get them added to our Portland Ad Fed History timeline.